Grub worms have had a good year. It's true that these worms are the immature stage of beetles. In most cases either Japanese beetles or green June beetles. Both of these insects have one generation per year. After the beetles mated this summer, they laid eggs, quit flying around, and died. Soon after, the eggs hatched. The larvae of these beetles, known as grub worms feed in the soil during the warm days of fall. As the soil temperature falls, they burrow deeper to spend the winter. Depending on the weather they may be higher and lower in the soil until spring when it warms. Then they will be back up near the surface and feeding on grass roots again. By early summer they are pupating to emerge again as flying adults. Milky spore disease is a slow but effective (sometimes) control when applied on a community wide basis. It may take several years to be effective. And since the adults can fly up to half mile or more to lay eggs, there's not much value in using that approach on a single lawn. Entomogenous nematodes are being evaluated for use in controlling grubs. So far results are mixed. Call us, at 454-7336 We are here to help. You can schedule a free lawn evaluation by clicking here. White grubs are the larvae of scarab beetles. The grubs of economic importance in Texas are those of the Japanese beetle, the green June beetle (June Bug), the southern masked chafer, the northern masked chafer, and the Asiatic garden beetle. Several other species, such as May beetles and June beetles, are also present but usually in low numbers. The Japanese beetle is consistently the most damaging grub in this state. All these grubs have cream colored bodies with yellow to brownish heads, brownish hind parts, and six legs. Mature grubs vary in length from 1/4 to 1-1/2 inches, depending on the species. White grubs usually lie in a curled or C-shaped position. Billbug larvae may also be present but can be distinguished by the absence of legs. All of the important species of white grubs in Texas have a one-year life cycle and spend about 10 months of that cycle in the ground. The life cycle of the Japanese beetle is typical for white grubs of importance in Texas. Eggs are laid in late June and early July, and larvae hatch out in July. These larvae feed on grass roots until cool weather arrives in October. In November the grubs burrow deeper into the soil to over winter. The grubs return to the root area and begin feeding in March. Larvae pupate and adults emerge in May and early June. This life cycle is basically the same for all species, although there is some variation in timing. There are three important exceptions. Emergence and egg-laying for the oriental beetle is about three weeks earlier than for the Japanese beetle, and emergence and egg-laying for the green June beetle is about three weeks later. Timing of chemical applications for these two species should be adjusted accordingly. The turfgrass ataenius has two generations per year, overwintering as an adult and developing a second generation of egg-laying adults by July. Therefore, this pest may require two treatments. JAN-FEB: Grub in winter cell. MAR-APR: Grub comes up near surface to feed. MAY: Grub forms cell and prepares to pupate. JUNE: Grub changes to pupa and then to adult, which emerges from ground. JULY: Beetle lays eggs in ground, preferably in grass sod. AUG: Eggs hatch. Young feed on living roots of plants. SEP-OCT: Grubs continue to feed and grow rapidly. Injury to roots of plants is most common at this time. Green June beetle larvae are also differ in their feeding behavior. Instead of attacking grass roots, these grubs feed mainly on decaying vegetation. Their burrowing smothers grass and uproots seedlings. Sometimes in the fall or after a heavy rain green June beetle larvae come out of the soil and crawl on their backs on the surface of the ground. They can be identified by this unusual behavior and by distinct spiracles, or dark spots, one per segment, on each side of the body. 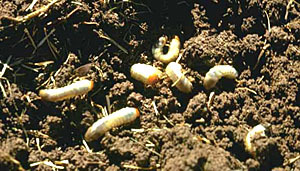 White grubs can be controlled in a timely and economical manner if proper controls are correctly applied at the right time. To prevent serious damage, examine all turf in April and again in August for the presence of grubs. Do not wait for brown patches to appear in the turf before inspecting the soil. Birds, moles, skunks and racoons all feed to some extent on grubs, and their digging in the lawn may be a sign of a white grub infestation. However, it is best to verify that grubs are actually present before applying pesticides. Use a heavy-duty knife or a spade to cut a 1-square-foot flap of sod and roll it back. Examine the soil and roots in the top 3 or 4 inches. Repeat this process in several locations. If you find an average of five or more grubs per square foot, a pesticide application is justified. The condition of the turf, its value, and its uses (for example, whether it is a home lawn or a golf green), and the amount of damage done by animals searching for the grubs may affect your decision on whether to apply a pesticide. A biological treatment method, useful against only Japanese beetle grubs, is the application of milky spore bacteria. This commercially available bacteria, when applied to the soil, infects the grubs and produces a disease. Grubs in the soil come in contact with the spores through ingestion. The spores germinate inside the grubs, eventually killing them. These spores work best when applied in late September or early October to soil with a pH level between 6 and 7. The results are not as rapid as with chemical insecticides, but the effects last many years. When milky spore disease becomes established, it will spread naturally to adjoining, untreated areas. Application at the time of turf installation may result in a more uniform distribution of the spores in the soil. This product is available at many garden shops under such trade names as Doom®, Japidemic®, or Milky Spore. The timing of the insecticide application is critical if control is to be effective. There are two approaches, preventative and curative. Some of the newer products (Merit® and Mach 2®) are preventative, and are most effective when applied prior to when the eggs are laid. This approach should only be used in areas that have a history of grub infestations. The curative approach is used when an existing infestation is detected. The best time to apply curative insecticides is when the grubs are actively feeding near the soil surface. Pesticides applied any other time will be ineffective. As indicated in the life cycle chart, this feeding occurs from August through October, and again in April through early May. Curative treatments applied in late summer or fall are usually more effective than spring applications because the grubs are small. Specific timing depends on the species of grub, and on location in the state. Timing of applications in the mountains will generally be later than in the eastern part of the state. Timing of applications for control of the turfgrass ataenius varies. Another factor affecting chemical control is irrigation. Irrigation prior to application is highly recommended, especially in dry weather. Grubs stay deep in the soil when conditions are dry, and irrigation a day or two before application helps to bring them closer to the surface and improves control. Insecticides kill grubs more effectively if watered in after application. The only exception is carbaryl (Sevin) used to control green June beetles; it should not be watered in. After treatment, green June beetle grubs may be found on the soil surface, whereas other grub species will die in the soil. Call us at 454-7336 or click here to schedule a free analysis.